Take everything away from us, and we are flesh, bone, blood and all that we have created. Antoine Fuqua’s gritty boxing flick is told from the inside out, and he accomplishes that by starting with the human frailty of the modern fighter. 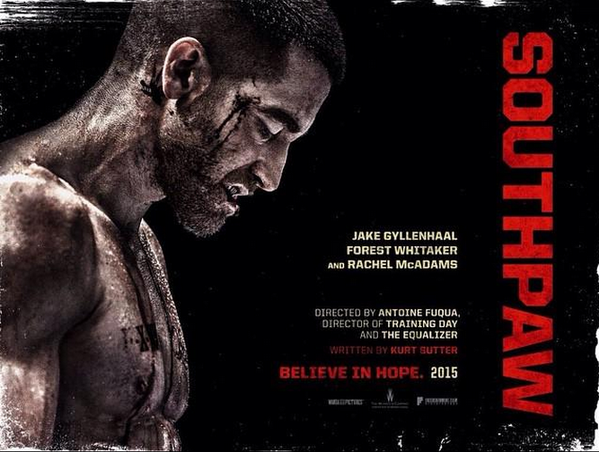 Southpaw may look familiar but it’s something different. The intense B-side track to Rocky. Jake Gyllenhaal(the fearless actor can’t miss right now) is Billy Hope, and the fight opens with preparations for Hope’s 43rd fight. He’s unbeaten, but that doesn’t include facial scarring, potential brain damage and visceral shock to the upper body. His wife, the beautiful yet tough Moureen(Rachel McAdams, evolving as an actress with every role) can see the toll being stacked on top of her family, which includes the couple’s adolescent daughter. Hope wins the fight, takes a beating and may walk away before the brutal shock of life stuns him and takes everything away from him. If you haven’t seen the trailer, good for you but this film will fake the left to the head and hit you in the kidneys with an uppercut you never saw coming. Instead of just going all Rocky and showing us the comeback trail of Hope from the gutters to the ropes, Fuqua and screenwriter Kurt Sutter(the maestro of Sons of Anarchy) beat the soul of Hope senseless first. Stripped of everything, the fighter has to be reborn. Is this like Mark Wahlberg’s The Fighter? Is it a modern Rocky? Yes on both counts, but more brutal. Those fighters didn’t have it as tough as Hope and that sets Southpaw apart and gives this seemingly conventional drama fresh legs in the cinematic ring. It helps to have a bruising thespian like Gyllenhaal in your corner. He broke onto the scene with Donnie Darko, October Sky and made it to the Oscars with Brokeback Mountain, but the Jake from the last few years is something different. A shade of gray twisted around several times into one of the movie’s finest actors. Brothers, Source Code, End of Watch, Prisoners, Nightcrawler, Enemy, and now Southpaw have the man on a hot streak and it’s has little to do with pushups and crunches. He is in the best shape of his life but it’s the broken exterior and the effort put into this character that sets the renegade performer aside from the rest. Gyllenhaal didn’t just get a six pack and learn how to throw a punch(he does that very well by the way). He throws everything he has at this role that moviegoers have seen in some form before but never this close and raw. Instead of hiding behind the physical aspects of the role, Jake climbs inside Hope and lets the stormy violent world of this man surround him for two hours. It’s a role that deserves Oscar attention but won’t get it. That will go to Forest Whitaker, who plays the chess player on the other side of the table, Hope’s meaner version of Mickey who whips our ex-champ into shape. Whitaker has a thing where he can be staring at the other actor but those eyes pierce through the screen and right through the viewer. His Tick has some skeletons in the closet and they took one of his eyes. Tick and Hope help each other in several ways, like two blind people putting a puzzle back together by feeling the pieces. 50 Cent smugs it up convincingly as a two face promoter and McAdams shines in a smaller role, but Oona Laurence gives more than the script intended with Leila, Hope’s daughter and the peacekeeper of his soul. The movie lovers have seen cute kids turn up the melodrama and others pour syrup over the screen, but this fine young actress decides to play the part honest. Her scenes with Gyllenhaal are as affecting as anything in the film and cut to the core of this husband and father film critic. The movie may be about the comeback of a punch drunk boxer, but the best parts are the elements outside the ring. They remain with you after the credits. That’s not to say that the ring element is mishandled. Fuqua and stunt coordinator John Cenatiempo(he is a face in many action films and cameos here as a courtroom officer) throw the boxing ring in our face, blood splattering all over the ground in front of us. The sound effects are never over the top but you will feel the sensation of getting punched. The makeup by Louie Zakarian on Gyllenhaal’s face throughout the film is expertly crafted. A boxer’s chin may be rumored to be made of glass or stone, but his eyes take the most damage over the course of a career and they get that right with Hope. He always looks like he just got punched and he’s never easy to look at. Some will dismiss Southpaw as just another boxing film, and the late James Horner’s score supports a triumphant flick that isn’t a completely new shade of paint on the big screen. However, Fuqua’s assured and firsthand gritty direction mixed with Sutter’s cutthroat dialogue and the pound for pound honest acting of its cast turn a familiar sight into something special. It’s like the indie darling and the mainstream film got into a ring and went 12 hard rounds. Southpaw is the rugged, honest and heartfelt result. Plenty of punches are thrown for sure, but the hardest ones in this story take place out of the ring.